Although there are distinct differences between philanthropic organizations and traditional businesses, one thing remains the same: the desire to attract followers who are genuinely interested in their product or service. Much like global brands, socially-savvy foundations have turned to social media to spread their messages, engage supporters, and raise funds. According to a 2013 survey, nearly half of the largest philanthropic foundations across the U.S. are using social media. Among those, 61 percent find it useful for things like promoting the work of the organization and its grantees, keeping up with news and trends, and soliciting proposals. We’ve seen how organizations like DoSomething, PBS, and Make-A-Wish have successfully integrated social media into their overall strategies — especially on Twitter and Facebook. Now we’re taking a closer look at how similar non-profits have utilized social services like Vine, Instagram, and Pinterest. In June 2013, (RED) — the global advocacy group that works with brands to fight AIDS — teamed up with Mashable to set a record for the most number of Vines created for a cause. Within 24 hours, 1,659 Vine videos that either audibly or visually promoted the social cause were created and tagged with #REDWorldRecord. Many of the submissions were featured on Mashable’s homepage and on the NASDAQ tower and marquee screen in Times Square. This June, the organization is partnering with restaurants, food trucks, and bars to encourage diners to purchase a (RED) dish as part of its latest campaign. Participating businesses will donate a portion of each dish to The Global Fund to help #86AIDS. Considering how many pictures of food exist on Instagram, we’re confident that this hashtag will be prominently featured on the photo-sharing app. Building awareness around a cause that lacks tangible elements can be tricky, but as this non-profit demonstrated, it’s very attainable. To Write Love On Her Arms is dedicated to support, hope, and help for people struggling with addiction, depression, and suicide. In addition to providing dozens of resources on its website, the organization relies heavily on its supporters to help share its message. TWLOHA’s Fear vs Dreams campaign invites individuals to answer two questions: what’s your biggest fear, and what’s your greatest dream? Participants are encouraged to share their answers (most often through images) on their social profiles, which are then re-posted to the organization’s Instagram account and website. Posts tagged with the #FearvsDreams hashtag average around 2,500 likes and hundreds of comments. In addition to using social media to build awareness and raise funds, many non-profits use it to highlight supporters and those who have donated, volunteered, and helped the organization in some way, shape, or form. Operation Smile, which changes the lives of children born with facial deformities, has dedicated a Pinterest board to its ambassadors and celebrity supporters. 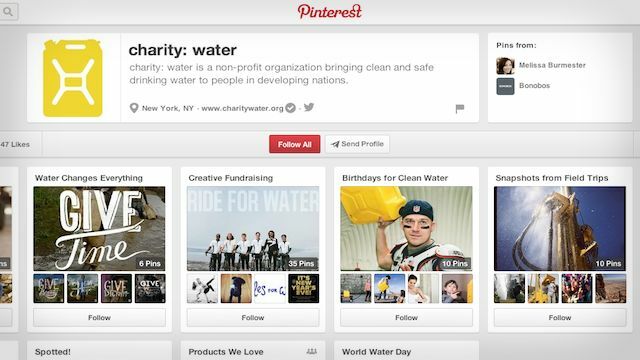 Similarly, Charity: Water — a non-profit devoted to bringing clean and safe drinking water to people in developing nations — uses one of its Pinterest boards to highlight creative fundraising. This is a great way to show appreciation for your supporters and inspire others to be creative in their outreach. And you can bet that those who are featured will share that pin with their networks, furthering the message still. One thing that all of these campaigns have in common is that they can easily be integrated into bigger social networks, like Twitter and Facebook, thanks to the use of hashtags and compelling visuals. Just because you’ve launched a campaign on one platform doesn’t mean you can’t bolster it on others. We also recommend that you check out how non-profits are using Facebook and leveraging Twitter to promote their cause.